Online Travel Agencies (OTAs) connect consumers with travel services such as hotels, flights, car rentals, tours and activities. Their power lies in aggregating offers from hundreds or thousands of suppliers, giving users the ability to compare many options on the same platform. OTAs have become influential in markets such as hotel bookings, flights and more recently – the car rental and “things to do” markets. With consumers flocking to OTAs to manage their trips, suppliers can use these platforms to distribute their offers in addition to their own marketing efforts. But choosing the right partners for your leisure business can be a difficult task. Different OTAs can provide you with a various set of advantages. You need to understand each platform’s strengths in order to derive the most value. Should you go with the big names like Ctrip and Expedia or choose specialist sites for tours and activities like Viator? Or maybe use a combination of OTAs to sell your products? In this post, we’ll highlight some of the top online travel agencies, which ones you should partner with and how to do it right. 1 Why should you partner with OTAs? Why should you partner with OTAs? As people increasingly book tours, activities, and attractions online, it’s important to establish a strong internet presence. The same goes for mobile which is starting to account for a significant portion of total bookings, even though the industry is still primarily offline. But establishing your brand online and on mobile takes significant investments of both time and money. This is where online travel agencies can help. With bigger players attracting millions of people each month, the main advantage OTAs provide to activity suppliers is access to more potential customers. Right here, right now – on both web and mobile. In addition, OTAs bring in a number of other benefits, including handling payments and customer service on your behalf. In essence, you can outsource much of your online marketing and sales efforts to OTAs. With huge advertising budgets and great search engine authority, bigger OTAs are well positioned in the online world and provide access to consumers that are otherwise hard to reach. But more than that, as we can see from the hotel industry, using OTAs is becoming a necessity for many providers. Often these are big companies that can create a great user experience for both consumers and suppliers. This is why travelers use them to manage their trips while suppliers manage sales and bookings. Of course, using OTAs isn’t free. You will often pay commission fees that usually range between 20% and 30% depending on multiple factors such as the platform you partner with, your offer, and sales volumes. This means that you should always prioritize sales and bookings going through direct channels – such as your website, phone or on-site – in order to avoid extra costs. OTAs are extremely useful for last-minute bookings and filling up capacity that would otherwise be wasted. If adding more customers to your tour or activity does not increase costs, filling up available slots using OTAs is a great idea. In addition, if you’re just starting out, your online strategy and positioning will take time to develop. In the meantime, OTAs can secure valuable bookings for you while you develop things like your search engine authority, social media presence, and advertising budget. Did you know Regiondo can help you to manage multiple sales channels in one place so you don’t have to track your bookings manually? Start your free Regiondo trial today. Before we look at the top online travel agencies individually, let’s examine the industry landscape. This way you’ll get a glimpse of each platform’s focus and compare them side-by-side. We’ll look at some of the main criteria you should consider when choosing an OTA to partner with such as web traffic, geographical focus, and commission fees. The number of monthly visits is one of the prime metrics OTAs track to measure their performance. While simple visits don’t guarantee sales, there’s a positive correlation between the amount of traffic and the number of bookings received. While it shouldn’t be the only thing you look at when choosing a platform to partner with, web traffic is a good indicator of the exposure you’ll get. Generally, the higher the traffic, the more people you will reach. However, we need to note that some OTAs provide a number of additional services like flights and hotel bookings which may account for most of the traffic. In order to avoid making wrong assumptions, we can compare traffic between OTAs that have a similar profile. For example, we can look at big OTAs that provide a range of travel services separately from specialist OTAs that focus solely on tours and activities. Moreover, niche players that don’t get as much traffic but provide other benefits should also be looked at separately in order to best understand their strengths and weaknesses. It should be noted that the numbers below are estimates based on data from SimilarWeb. Expedia and Ctrip are two of the most prominent OTAs that have been around for a long time and aggregate the full spectrum of travel services from hotel bookings to car rentals. If we look at the website visits between May 2018 and July 2018, we can see that both platforms attract a similar amount of traffic. Expedia sees a steady month-on-month increase as the summer months arrive while Ctrip saw a slight decrease in June before getting ahead in July. It’s hard to estimate what part of website visitors actually book a tour or activity but we can make an educated guess. Expedia reported that 2017 revenue from their Local Expert brand (“Things to do” section) was just over $500 million. With a total revenue in 2017 of around $10 billion, this represents roughly 5% of total sales. Assuming a similar distribution in terms of traffic, this could amount to roughly 10 – 12 million visits related to tours and activities for these big OTAs (across the full 3 months). Therefore, monthly numbers are likely in the range of 3 million to 4 million visits. When it comes to website traffic, Viator clearly leads the way with nearly 30 million visits in the last 3 months – just around 10 million per month. Not surprisingly, it’s parent company TripAdvisor is the top referring site and accounts for roughly 16% of Viator’s referrals (SimilarWeb data). GetYourGuide and Klook received about the same number of visits as Viator – but combined together. Founded in 2009 and 2014 respectively, these relatively new OTAs have quickly become key players in the industry. Apart from well-established OTAs with millions of monthly views, there are also niche platforms that specialize in a particular geography or vertical like VELTRA and Musement. VELTRA generates nearly 80% of its traffic in Japan and specializes in providing tours and activities to the local market. On the other hand, Musement is focused on Europe but includes experiences in a wide range of verticals – from free activities to events, concerts and even tennis games. Despite being relatively small, these OTAs differentiate themselves with other qualities and boast some impressive partnerships, meaning they can still generate lots of awareness for your brand. Apart from their main websites, OTAs often partner with hundreds or even thousands of agents and resellers. These can range from small local travel sites to large airlines, banks, and retailers. Affiliate partners distribute OTA products to their website visitors in exchange for a set commission fee for each referral. This is why you will often see tour and activity offers when checking out of certain airlines. Basically, most platforms allow their partners to embed a code on their website which pulls relevant offers from the OTA’s inventory and shows them to travelers and other consumers. In addition, big OTAs like Expedia own multiple brands and websites and share their inventory. If you use Orbitz, for example, you will see the same offers and booking engine as the ones on Expedia Local Expert. Partnerships and affiliates allow OTAs to bring your offers to an even larger network of travelers and consumers. If you’re a new supplier, this can be of huge significance while you grow your online presence and brand awareness. When choosing an OTA to partner with, it’s important to know where their target audience is. This way you’ll know if they’re a good fit for your tour or activity. For example, there’s not much point in marketing an escape room to travelers from China unless you’ve translated your instructions in Mandarin or at least English. If your services require advanced skills in a language, you should take an OTA’s geographical focus into account. Figures relate .com domains only. Not surprisingly, one of the biggest markets for OTAs is North America. So if you’re partnering with a platform like Expedia or Viator, there’s a good chance your offers are reaching mostly US travelers. On the other hand, GetYourGuide also receives most of its website visitors from North America, but the number is lower at just 25% which is balanced compared to Expedia’s 81%, for example. Taking their .de domain into account, Germany is likely the biggest market while Spain and the UK are also important for GetYourGuide. Klook, VELTRA, and Ctrip largely depend on East Asian markets like Japan and China while Musement is the only OTA from our sample that receives most of its website visitors from Europe. 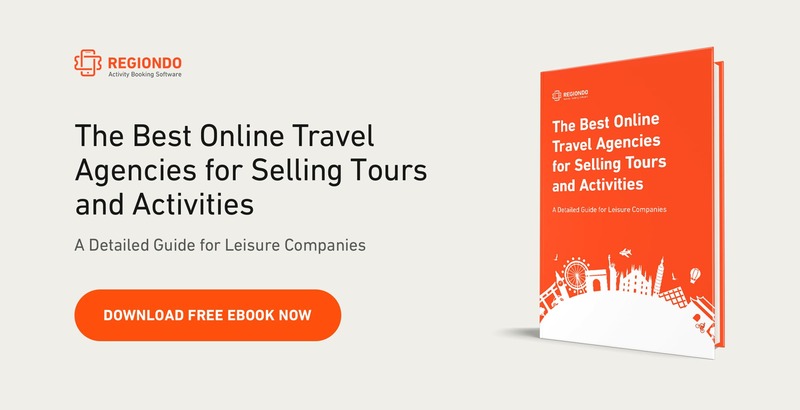 In order to attract more customers, OTAs develop tour and activity portfolios from hundreds or thousands of destinations. The more breadth they provide, the bigger is the pool of travelers they can address. Each new country or city adds a number of new potential customers that can book tours and activities. In addition, a higher number of destinations increases the reach when it comes to local residents. For these reasons, even niche OTAs like Musement develop a strong arsenal of destinations. Below you can see a graph with the number of destinations covered by some of the more popular platforms. For this sample of OTAs, GetYourGuide leads the way in terms of coverage with more than 2,500 destinations. Viator isn’t far behind with 2000 while Musement and Expedia Local Expert cover about 1000 each. For tour and activity suppliers, the number of destinations where an OTA has a presence is a good indicator of the marketplace landscape. If a large amount of tours and activities from your city are on the website, this means there is good demand for local experiences on that platform. Skift conducted research on some of the bigger OTAs and found that most of their inventory is usually in Europe (which is still the biggest tourist destination by traveler count). The chart above can give you a good indication of which platform is best for your location. If you’re based in Europe, most OTAs will give you sufficient exposure. However, providers like Klook hold a relatively small part of their inventory in Europe and most of their customers look for experiences in Asia. That doesn’t mean you should completely ignore Klook – commissions are based on sales only so you don’t lose anything by having a presence on this platform. Having a large inventory of activities is important for similar reasons as destinations. The more activities on offer, the more potential customers fall within the OTA’s reach. While the number of activities seems likely to correlate with the number of destinations covered, Viator is a clear leader in this domain with 60,000+ activities – despite covering fewer destinations than GetYourGuide. This means Viator is well-placed in certain popular geographies and stocks a disproportionate amount of tours and activities compared to its main rivals. Klook and Ctrip come in 2nd place with around 40,000 activities each. Despite its size, Expedia LX trails behind with 25,000 activities – the same as niche player Musement. In general, we can see the number of activities is high across all platforms as it’s a key factor for attracting customers. In order to handle online marketing, payments, and other services on your behalf, OTAs normally charge a commission for each booking you receive through their website. The commission often depends on the type of service you provide with discounts for large sales volumes. Below you can see indicative commission rates for some of the top OTAs. Specialized OTAs like Viator and GetYourGuide tend to charge around 25% while big platforms like Expedia can go as high as 40% given their extra services and exposure. It seems smaller platforms like Musement can give you better prices which is logical in light of their online reach. The same goes for providers based in Asia where market dynamics allow for cheaper prices overall. Now that we have a high-level view of the OTA industry landscape, it’s time to explore each platform on an individual basis. Below you will find our pick of the top online travel agencies for selling tours and activities ranked by estimated monthly traffic. Expedia Local Expert is the “Things to do” section on the main Expedia site. Started in 2014, it’s a relatively new service for the travel giant but it’s gaining traction quickly. Despite the size of Expedia, its Local Expert brand is a relatively new product and therefore the marketplace is not so crowded. This makes it a good time to join and build up your ratings and reviews before competitors do. Expedia is one of the most admired brands both internationally and in the US. This makes it an ideal partner that can bring your offers to a loyal customer base. With over 23 million email subscribers, Expedia is able to implement targeted email campaigns that get you in front of the right people at the right time and place. This is how your offer could look like on Expedia Local Expert. Use Expedia LX if you want to reach US travelers via email, web, and mobile. Learn more about Expedia Local Expert and how to sign up in our dedicated post on the topic. Viator is one of the pioneering OTAs that has been around since 1995. In 2014, the site was purchased by TripAdvisor in a deal worth $200 million and has become the main tour and activity partner for the reviews giant. As TripAdvisor’s main tour and activity supplier, Viator is the surest way to get exposure on the reviews giant’s website. Viator is a good partner if you want to stand any chance of ranking for competitive keywords like “things to do in [your city]”. The user-generated content from TripAdvisor and Viator reviews coupled with their long history online boost both brands in search results. Viator’s ad campaigns on Google, Bing, and Facebook can supplement your online traffic and bookings. Where search isn’t enough, they’ve got you covered on that front as well. This is how your offer could look like on Viator. Use Viator to get exposure on the TripAdvisor platform and reach a wide range of travelers online. Learn more about Viator and how to become a supplier in our dedicated post on the topic. Founded in 2009, GetYourGuide is one of the fastest-growing OTAs specialized in tours and activities. As Viator’s main competitor, the company attracts millions of users across a wide range of geographies. One of GetYourGuide’s key advantages is the great user experience available to customers. As a GetYourGuide supplier, travelers and locals can book your offers in a seamless way helping you fill capacity and reduce no-shows. Apart from a robust web experience, GetYourGuide boasts beautiful and highly functional smartphone apps. This is a great way to reach people on mobile, especially if you don’t have the capacity to invest in that domain. As a commission-only platform, GetYourGuide makes money only when you get bookings. This is why they work extra hard to make your offers stand out with their free optimization service. This is how your offer could look like on GetYourGuide. Use GetYourGuide to delight your customers with an outstanding user experience on web and mobile. Learn more about GetYourGuide and how to become a supplier in our dedicated post on the topic. Klook is a specialized tour and activity OTA that’s focused on the East Asian market. The company is growing quickly since its foundation in 2014 and boasts high profile investors like Goldman Sachs and Sequoia Capital, among others. Similar to Ctrip in China, Klook’s team can help you market in other Asian countries, giving you access to travelers from Taiwan, Hong Kong and Singapore. In addition to its consumer apps, Klook offers a robust app for partners where you can stay productive and track bookings on-the-go. Klook has a knack for attracting both big-name suppliers and investors. With Disneyland and Universal Studios using the platform, you’ll be in good company. This is how your offer could look like on Klook. Use Klook to reach travelers from East Asia at an affordable cost. Learn more about Klook and how to become a partner in our dedicated post on the topic. VELTRA is a tour and activity OTA based in Tokyo. Although smaller than the likes of Viator and GetYourGuide, the company is well positioned in the local market with it’s long-standing history since 1991. VELTRA has established partnerships with some of Japan’s largest companies, including Rakuten and Japan Airlines. Partnering with this OTA can get you in front of Japanse travelers like no other. Corporate Japan is known for its loyal workforce and stability. VELTRA has been serving the travel market since 1991 so you know you’re in good hands when listing tours and activities with this platform. Your VELTRA offers can be translated for free in Japanse, Korean and Taiwanese, among other. This allows you to reach local customers in their own language and re-use the translations across other platforms too. This is how your offer could look like on VELTRA. Use VELTRA to reach travelers from Japan and translate your offers in East Asian languages. Learn more about VELTRA and how to become a partner in our dedicated post on the topic. Musement is a niche provider and dominates the in-destination experiences market in Italy. The Musement team is highly ambitious and the company has major plans to expand across different verticals in Europe and beyond. As a relatively small OTA, Musement has the capacity to provide a personal experience to its suppliers, pairing you with an account manager to assist you when using the platform. For bookings made through Musement, the OTA can handle both online and offline communication with customers, making it easier for you to keep up with customer service demands. To tackle high customer acquisition costs, Musement is partnering with select companies like Vodafone Italy to derive synergies and increase bookings in a cost-efficient way. This gives Musement additional reach across Italy and Europe which makes it an even more reliable partner. This is how your offer could look like on Musement. Use Musement to reach a wide range of (mostly) European travelers and ease the burden on customer service. Learn more about Musement and how to become a supplier in our dedicated post on the topic. By now you probably have a good idea of which OTAs are right for your business. But what if you want to partner with multiple platforms? Managing several channels in addition to your website and offline sales is hard work. You need to keep track of multiple systems, input numbers and update your bookings calendar manually. That’s a lot of time and effort devoted to things that can be automated. To make things easier, we’ve developed the Regiondo Channel Manager. It’s a robust system that lets you control multiple sales channels in one place. With over 140 active sales channels, including Expedia LX, Viator, and GetYourGuide, you can keep track of all your bookings in one place. To get started, you’ll need to create a free Regiondo account and activate the channels you want to use from the Channel Manager. As we can see from the flights and hotel booking industries, OTAs are here to stay. Customers often prefer to compare deals and buy what they need in one place from websites they know and trust. Instead of fighting these tourism trends, it’s best to utilize it to your advantage by choosing the right OTAs to partner with. Individual platforms present different benefits and the ones you choose will depend on your goals, strengths, and weaknesses. If you want to reach East Asian travelers but don’t have the capacity to do it yourself, you can choose providers like Ctrip, Klook and VELTRA to do the groundwork for you. Or maybe you’d like a cut in the large US market but can’t afford to advertise there. This is when the likes of Expedia LX and Viator could help. And if you want the best of both worlds (new and old), while giving your customers superb customer service, GetYourGuide and Musement are the way to go. Lastly, you can also partner with multiple OTAs to get the maximum exposure. This is a great option if you’re just starting out and need to fill capacity quickly.